You may have heard about the importance of social media. You know, it determines how popular your business is on the web, which usually equates to how successful it is in the real world. But with all the avenues of social media – Facebook, Twitter, YouTube, yadda, yadda, yadda… how do you keep track of just how popular you are on the interwebs? Meet entourank. Entourank scours the web to determine how many mentions your website’s brand is getting on the social media scene. Why is this so important you may ask? Well, your popularity on these sites can also determine your company’s SEO (you know, how you get searched on the web. Your bread and butter), and it can also determine viral marketing. In other words, the more social media mentions, the better. In order to calculate how many mentions a certain website receives, entourank has created a platform that finds these mentions, and then takes the info and inputs it into a ranking system to find your social rank. The site already has over a million websites in their database, where it stores the data it finds, and uses a special algorithm to determine a 0 to 10 ranking system. The live mention of Google on each of these sites is then counted and a 0-10 ranking is given. Let’s just say, Google is acing it. You can then click the social media tab results to see the exact mention of the website and a link to that page. 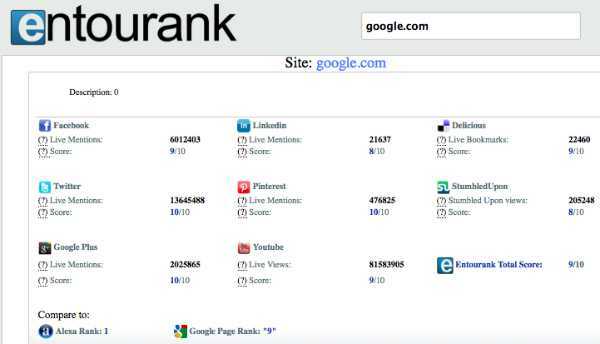 Basically, entourank keeps you up-to-date on how popular you are on the world wide web. Ilan Alon and Leon Brenig are the duo behind entourank. Ilan, a programmer who also started blogsynergy.com (a social network for bloggers) programmed the site, while Leon, a Physicist, created the mathematical formula for determining the ranking scores. Needless to say, there are some brains behind the platform. Unlike other ranking systems, entourank was created to analyze websites based on social importance, a ranking that tends to be the biggest influencer of popularity. If you’re curious who is talking about your site on the web, check out entourank and make sure you’re making the grade.